Stuffed grape leaves are a staple in Greek cooking, and they're really not that difficult to make once you master the stuffing and rolling technique. Served hot or cold, as an appetizer, side dish or main course, they offer a delicious way to jazz up your dinner menu. Fill a Dutch oven 3/4 full of water and bring it to a boil. Once it boils, turn off the heat. While you're waiting for the water to boil, cut the stems from the grape leaves and discard them and then rinse the leaves. Put them in the pot and let them sit for about 5 minutes to soften. Transfer the leaves to colander to cool and drain before stuffing. Pour the water from the Dutch oven into a large bowl. This will be reused when cooking the stuffed grape leaves. Arrange about 5 leaves in the bottom of the pan. These will help keep the stuffed grape leaves from burning as they cook. In a large bowl, combine all the stuffing ingredients except for 1/2 cup of lemon juice and work together by hand until thoroughly mixed. Working on a cutting board or other flat surface, lay out one grape leaf with the veined side up and the bottom end where the stem used to be facing toward you. Place about 1 tablespoon of stuffing near the bottom of the leaf and roll up the bottom just enough to cover the stuffing. 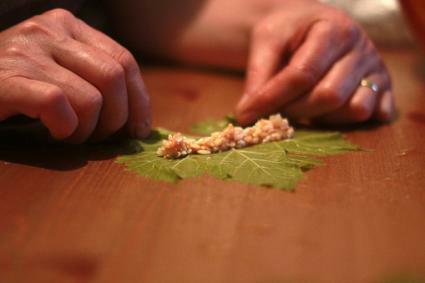 Fold in the sides of the leaf and then finish rolling to the leaf tip. 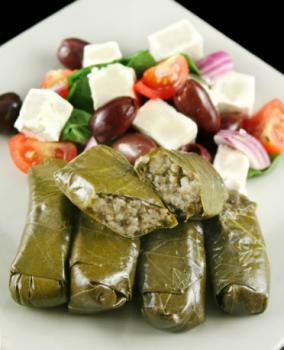 Lay the roll in the bottom of the Dutch oven over the grape leaves lining, placing the tip of the roll facing down to keep the grape leaf from unrolling. Repeat until all the grape leaves have been stuffed and arranged in layers. Lay a heat-safe dish on top of the rolls to keep them in place. Slowly pour in just enough of the grape leaf water around the edge of the plate to cover the rolls and then add the other 1/2 cup of lemon juice to the pot. Put the lid on the pot, bring it to a boil and then reduce the heat to a simmer and continue cooking for approximately 45 to 50 minutes. You can add a little more water as needed to keep the top layer covered. Test one grape leaf at the end of the cooking time to make sure the rice is completely cooked before turning off the heat. Using a large slotted spoon, carefully remove the stuffed grape leaves from the pot and transfer them to a platter or large casserole dish. Serve hot, or let them chill in the refrigerator for about 2 hours if you prefer to serve them cold. Prepare the fresh leaves as directed in the meat stuffed recipe above and let them drain while you prepare the filling. In a large sauté pan, heat the olive oil over medium heat. Add the minced onions and sauté them until they're just translucent; stir to keep them from sticking to the pan. Except for 1/4 cup of the lemon juice, stir in all the remaining stuffing ingredients (the rest of the ingredients except for the broth) until they're combined well and remove from the heat. Let the mix cool for about 15 minutes before you begin stuffing the leaves. Line the bottom of a Dutch oven with grape leaves. 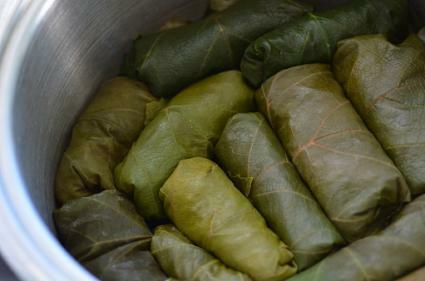 Following the filling and rolling process described in the recipe above, place 1 tablespoon of filling on a grape leaf, roll it up, and place it in the Dutch oven with the leaf tip on the bottom to prevent it from unrolling. Repeat until all the grape leaves are filled and arranged in the pot. 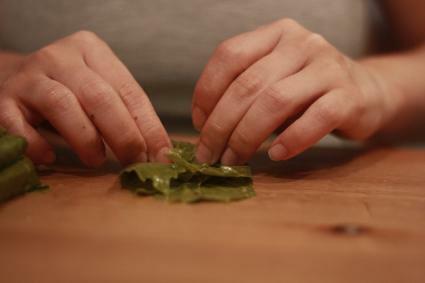 Lay a heat-safe plate over the grape leaf rolls. Pouring at the inside the edge of the pan, add the vegetable broth and remaining 1/4 cup of lemon juice plus enough water to cover the rolls completely. Put the lid on the Dutch oven and bring to a boil. Reduce the heat to a simmer and continue cooking for approximately 35 to 40 minutes. You can add more hot water to the pan as needed during cooking to keep the rolls covered until they're finished. Test one roll to see if the rice is tender before turning off the heat. Use a slotted spoon, carefully transfer the rolls to a serving platter or casserole dish. Serve hot or chilled as you prefer. 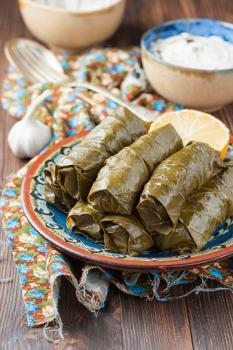 Once you make your grape leaves, there are many great ways to serve them. It all depends on whether you use them as an appetizer, a side dish, or a main course. If your family really loves stuffed grape leaves, you can easily double the recipes here to make more. In fact, this is a great dish to serve at potlucks and other events, so perfect your rolling technique and treat everyone to something special for dinner.